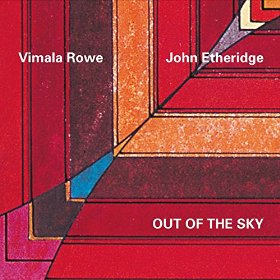 Just released is veteran guitarist John Etheridge and vocalist Vimala Rowe’s breathtaking collaboration, Out Of the Sky. John Etheridge’s reputation in the jazz world cannot be overstated. A genuinely virtuosic fusion guitarist, Etheridge is one of a handful of players who can claim to have helped shape the character of modern jazz guitar. He has been described by fellow fretsman Pat Metheny as ‘one of the best guitarists in the world’, a distinction that is due in no small part to his tireless exploration of the possibilities of his instrument. A hugely respected artist in his own right, Etheridge also claims an impressive collaborative history, from his seminal work with groundbreaking fusion group Soft Machine to his longstanding status as the guitarist of choice for jazz icon Stéphane Grappelli. It is safe to say, then, that when it comes to playing companions, Etheridge’s judgement is second to none. In vocalist Vimala Rowe, he has not only found a partner of rare ability but a talent that perfectly compliments his explorative nature. An exemplary jazz singer with a faultless and deft expression, Rowe has a unique style that is further enhanced by her past training in classical Hindustani vocals. Her soulful, moving, and unerringly committed performances on Out Of The Sky are truly revelatory. Out Of The Sky is an album that offers both a quintessential jazz feel and the discernable atmosphere of new territory being discovered. Peppered throughout the refined jazz and blues tones are tantalising touches of flamenco, Indian classical, and African timbres that beat at the boundaries of genre. This combination of influences, along with Etheridge and Rowe’s staggering sensitivity to each other’s styles, makes Out Of The Sky an otherworldly experience. Perhaps most pleasingly, the tracks also resonate with the deeply personal - as well as musical - connection shared by these two artists at the top of their game. Out of the Sky is a powerful, expressive, and joyous meeting of minds. With this outstanding collaboration, John Etheridge and Vimala Rowe have created an album that marks out the vocalist-guitarist duo as a site of previously untapped possibility. Burt Bacharach, George Duke, David Sanborn "Wives And Lovers"
Bebop Alto Saxophonist Richie Cole Pays Tribute to a Lifelong Hero on "Cannonball"
RECORD STORE DAY 2019 IS SATURDAY, APRIL 13TH AMAZING TITLES FROM DOZENS OF INCREDIBLE ARTISTS ANNOUNCED!